The use of armour has been around for ages - ever since cavemen began hunting and then fighting each other. The idea is to protect an individual who is engaged in life-threatening activity such as combat. Knights from the Middle Ages provide a classic example. Individual Protection - Medieval Style. These protective systems are now legal requirements under Workplace Health & Safety Laws. One of the most dangerous workplaces of all is the fire ground. The only people able to help us are our fire-fighters. However, our "Wildfire Knights" need much more protection than mere body armour and chain-mail. They need something like this! The Jumbo 5000 Fire-fighting Tank - A Modified Leopard AFV - image is courtesy of Texoga Tech - USA. This is a Leopard tank - with a difference - it is a fire-fighting vehicle. By utilising the Leopard's basic chassis, this AFV has been re-designed as an armoured fire-fighting vehicle - one element in our Armoured Strike Team arsenal. Just as its military variant, it retains the classic benefits of an AFV. This fire-fighting vehicle is the result of years of development. Just as the Medieval Knight sought protection in battle, this vehicle too, was designed with protection in mind, but for a different type of battle. Despite the differences, there are remarkable similarities between war-fighting and fire-fighting. To discover this inter-relationship we need only review the evolution of armour. This painting of the French Ironclad - Gloire - is a fine example of how naval crews were protected from enemy gun-fire. Protecting sailors with body-armour was never going to work, so naval protection expanded to armour the ships. Armour - increased protection for crews. Steam-power - able to cruise at a pre-determined speed - independent of wind - adhere to timetables. Mobility - freely move in any direction. Attack 'into the wind' - unimaginable with sail alone. Steam-powered ships revolutionised high-seas travel and it was soon applied to the land. The Age of Railways had arrived. Everyone desired a piece of this 'new technology' including farmers. Steam tractors gained wide use and many were exported to all corners of the globe. They were powerful - but - as this image shows such power came with significant limitations. Increased 'horse-power' required a subsequent increase in weight. But, once again innovators overcame the problem. Englishman David Roberts built a track-system, ensuring weight distribution over a much larger area, much more effective than the wheel. The 'chain-track' tractor was patented in 1904. This powerful model was exported to Canada. It was designed for safe road travel, without damaging the surface. Roberts tested this tractor in battlefield simulated conditions with senior members of the British Army. During one of these demonstrations soldiers named this vehicle the 'caterpillar' tractor - a name that endures to this day. In 1911, after the British War Office showed no further interest, Roberts became frustrated and sold the patents to the Holt Tractor Company in the USA. 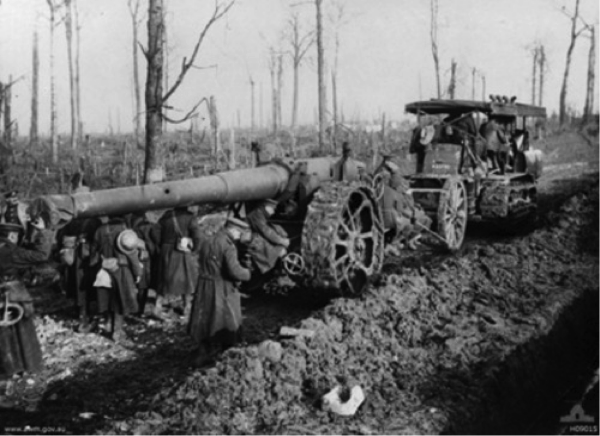 Allied Heavy Artillery under Tow - Trones Wood circa 1917 - image courtesy of the Australian War Memorial - Canberra. These new developments began around Christmas, 1914 - LTCOL Ernest Swinton happened to notice a Holt tractor towing an artillery piece - this inspired him to write a memo to the Commander-in-Chief [C-in-C], 'planting the seed' for Armoured Fighting Vehicles. Despite a lack of interest by the C-in-C and the British War Office - the idea was passed on to Winston Churchill, the First Lord of the Admiralty who saw the potential benefits of such a weapon. With Prime Minister Lloyd George's support, the 'Landships Committee' was formed; its task to design and manufacture a test model. However, it was only in the later stages of this conflict that tanks and their crews finally began to achieve significant strategic influence over the battlefields - and more importantly - the end of the War. There were many contributors to the doctrine of Armoured Warfare in World War I - including pioneers such as CAPT Levavasseur [France] - CAPT Liddell-Hart [Britain] & COL Fuller - [Royal Tank Corps]. Whilst many Commanders could see the benefits of tanks in the attack or assault phases, one allied General, the Commander of the Australian Corps, viewed the preservation of lives as paramount..
...under the maximum possible array of mechanical resources in the form of guns, machine guns, tanks, mortars and aeroplanes." Today, most large-scale military operations utilise various forms of Combined Arms Doctrine. A Late Model Mark V - perhaps the most enduring example of World War I tank development. From this early technology, AFV designs have became much more sophisticated - and today - still provide devastating fire-power on the battlefield. Whilst "tanks" are still being used as weapons of war, armoured vehicles are increasingly being developed for other roles - including important humanitarian and life-saving uses. This Modified US M60 Patton tank - known as the M60 Panther - is used for mine-clearance operations within former war-zones. This provides an excellent example of personnel protection - the crew operate the vehicle by remote-control from a safe distance. Can We Apply War-fighting Doctrine to Fire-fighting Operations? The plan is to adapt 'yesteryear's' solutions in battlefield personnel protection and utilise this concept for 'today's' protection of crews in wildfire operations. In other words - as Monash utilised early 20th Century Combined Arms Doctrine - where "engineering solutions" were applied to the battlefield - his goal - to shield and protect his troops from avoidable danger. Perhaps it is time to offer our 21st Century fire-fighters, similar innovations that offer protection levels appropriate to their threat levels. After all, many of them are volunteers - they don't even get paid to undertake such extra-ordinary tasks - yet they put their lives on the line for us all! He held the view that warfare was essentially a problem in engineering, of mobilizing resources, like the conduct of a large industrial undertaking; in 1918 the men in the line knew that all was right behind them. An Australian Leopard Tank on Exercise in 2005 - Photo courtesy of the U.S. Navy by Photographer's Mate 1st Class (AW/SW) David A. Levy. This is a Leopard tank - it is designed for war-fighting. The question is - can we justify the expense, effort, time and resources to adapt tank design for fire-fighting operations? ..we now must face our common enemy "WILDFIRE" and use all our technology to safely defend our homes and loved ones.. So let's turn our Swords into Ploughshares! A variant of the German designed Marder APC - image courtesy of Airmatic GmbH - Germany. This Armoured Personnel Carrier is also especially designed for fire-fighting. Note the dozer-blade which is used to clear roads or fire-trails blocked by logs or other debris. The vehicle may be operated in 'hatch-down' mode, protecting the crew from falling tree limbs, ember attack and direct exposure to radiant heat. Onboard breathing systems protect personnel from smoke or toxic fume inhalation - ideal for chemical and industrial fires. Infra-red and thermal-imaging monitors enable safe operation of this vehicle within any of these extreme-risk environments. Just as its military variant, it operates in rough terrain, without the risk of punctures or staked tyres. Aggressive Firefighting with nearly unlimited offroad capabilities but with a maximum speed of 65km/h also agile on road. Concept RED: R.escue, E.extinguish, D.efend. Rescueing people that are entrapped by a wildfire is first time possible due to the armoured tracked vehicle, guided by a unmanned aerial vehicle (UAV, drone). Will Fire-fighters be Affected by The Global Financial Crisis?